My “Brown” challenge for HSM 2015 isn’t really a wearable item, and that makes me feel a little weird. It’s an accessory for an accessory, to be precise. It started when I found a silk dress at Goodwill for $3.00. It wasn’t old or anything, just super ugly and 100% silk. So I got it. I have a hard time finding nice silk yardage around here (it’s usually raw, slubby, dupioni stuff = eww). There wasn’t a whole lot of silk there for any sort of real project, so I had to think of a small thing to make. I have a little collection of silk floss, so I decided a little embroidery, silk on silk, would be fun to try. 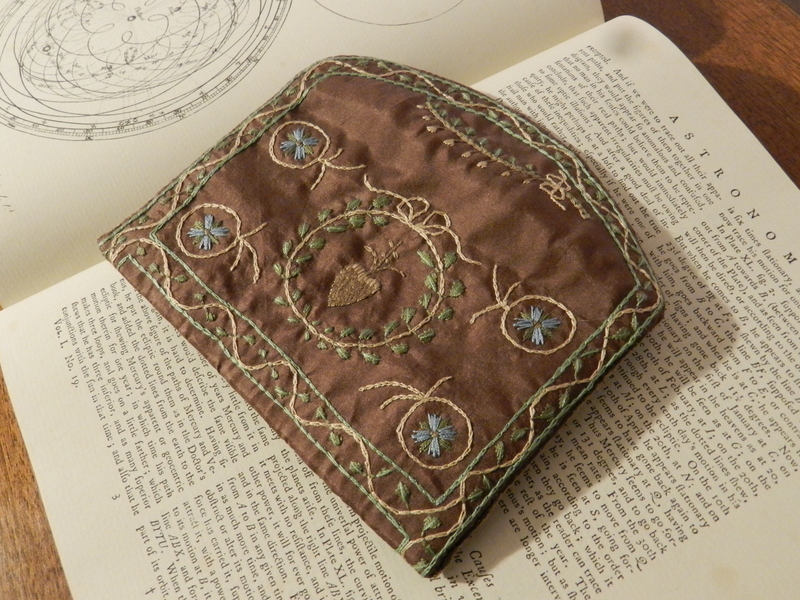 I designed a small letter case because I didn’t have an embroidery frame big enough for a larger one, and I wanted to be able to see the whole design at once … I kind of designed it as I went. Planning is overrated. I used designs from a red silk letter case embroidered with gold from the Kyoto Costume Institute. I had to adapt the design for a smaller size (and less competent embroidery ability), so some elements got cut or changed. The blue flowers (which look like pinks, but “blue pinks” sounds weird) were taken from dress suit buttons, also from a KCI item. Both items are late 18th century, I think the date ranges are both 1790-1810. The interior is lined with the same silk (I wanted white silk, but again, I have a hard time finding silk here) and thin card stock for shape. I used cotton canvas for a backing, too. 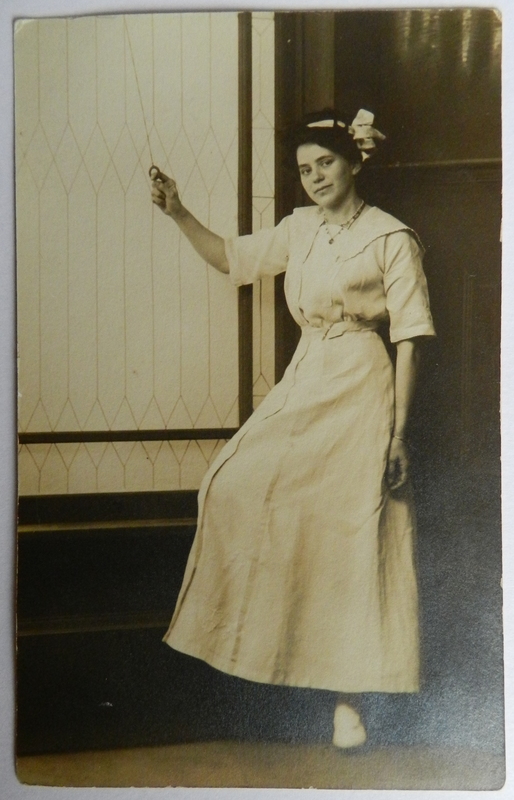 I’ve been liking my growing collection of old photographs. They take up less space than clothing, haha. Here’s half of my finds from yesterday – I went to flea markets and antique stores and came back with a nice collection! Only one was dated or inscribed, so the rest are kind of speculation. 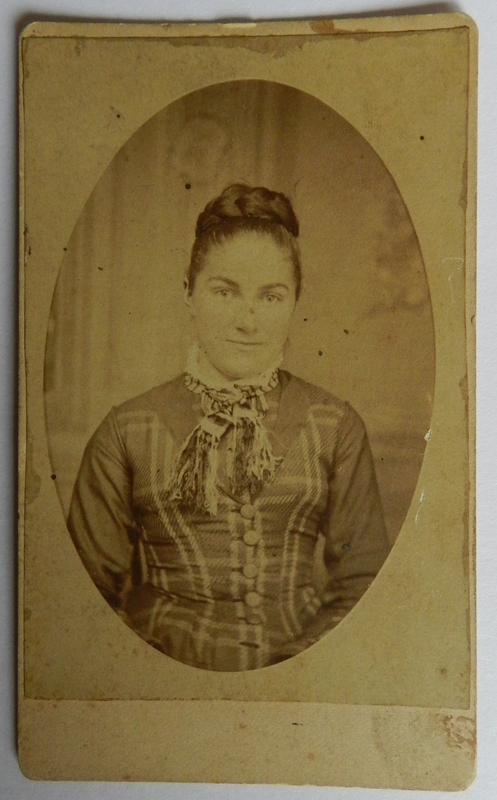 Here’s the oldest of the bunch – while I have a lot of photos that might be from the 1870s, she’s definitely that old. Her hair is awesome, her dress is pretty cool – and look at her smile. I feel like she’s genuinely happy. I like the spontaneity of this pose. 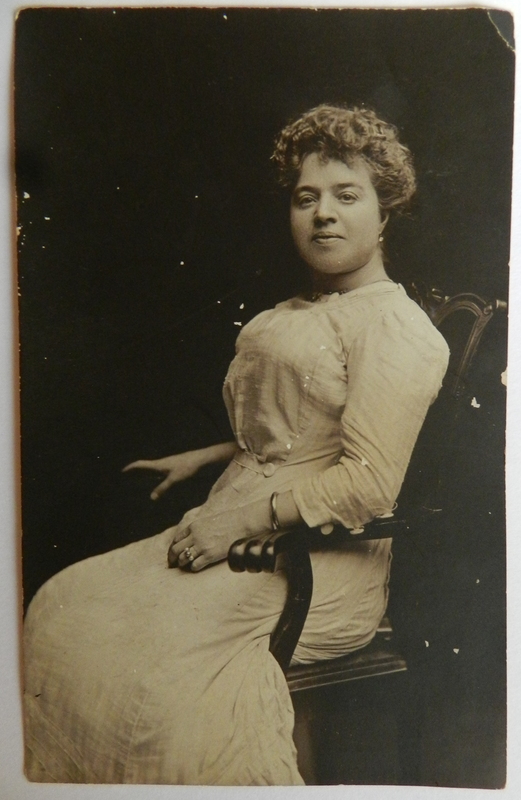 I’m thinking this is between 1910-1914. 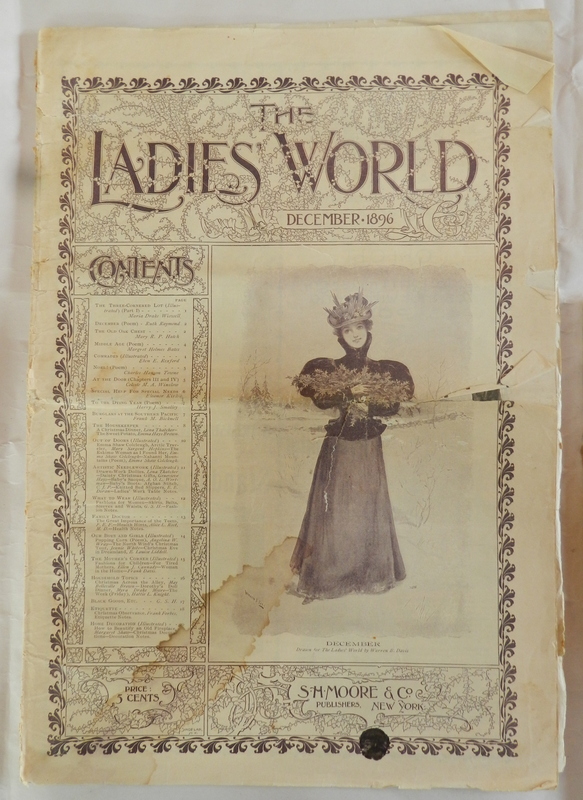 Another 1900ish picture. This photo is so striking. 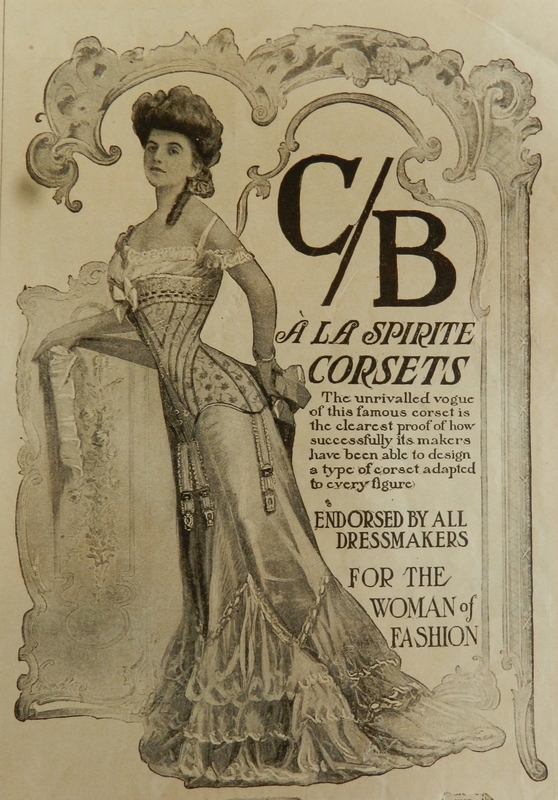 She looks proud and confident and she’s such a beautiful Gibson Girl model. She’s also not super skinny, which is always nice to see because it helps dispel the people-were-smaller-back-then myth. I’m a little confused with the front waistline of her dress. it looks like a raw edge tucked into a waistband, and coming loose. The cloth looks pilled and ravely too. 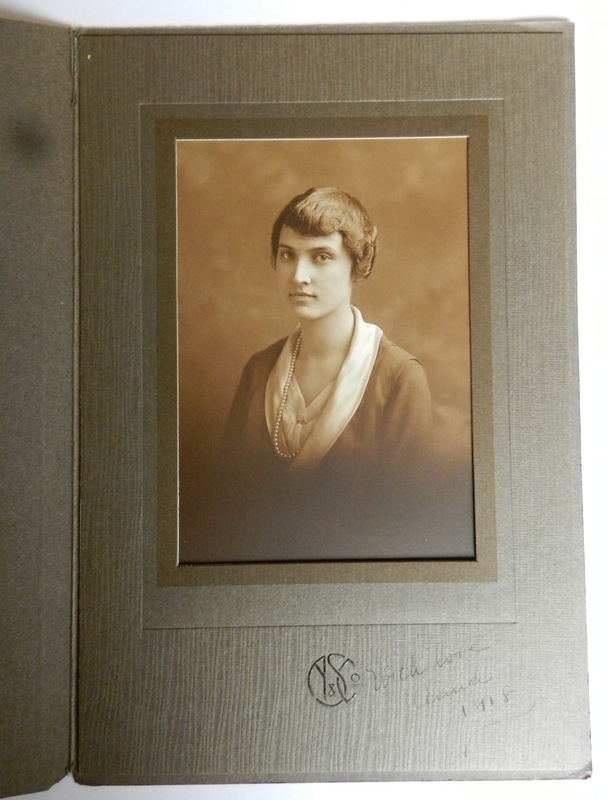 This is my only inscribed/dated photo from this batch: “To Anna with love, 1918”. 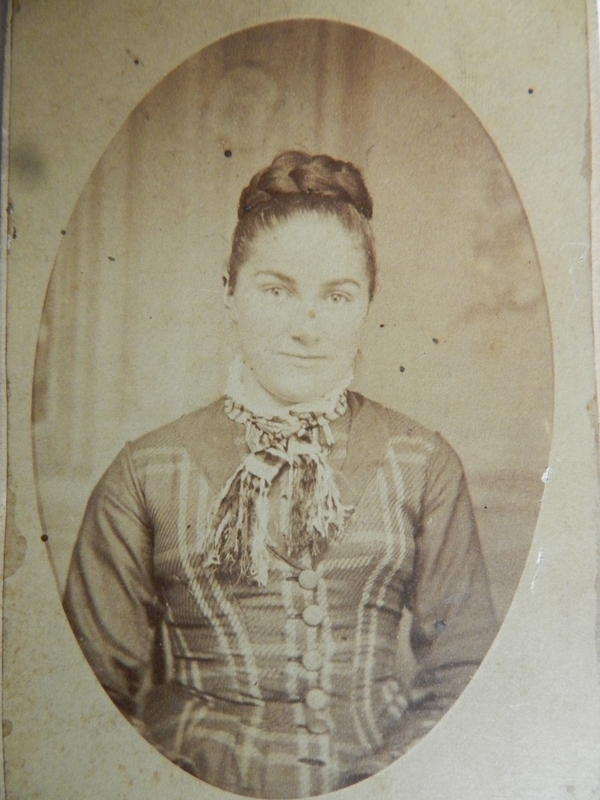 This woman is now known to me as Lady Spock. But check out her hair. Lady Spock’s putzy matted hair. When you really want that new short look, but you just can’t bring yourself to cut anything … here are 1,309 hair pins. 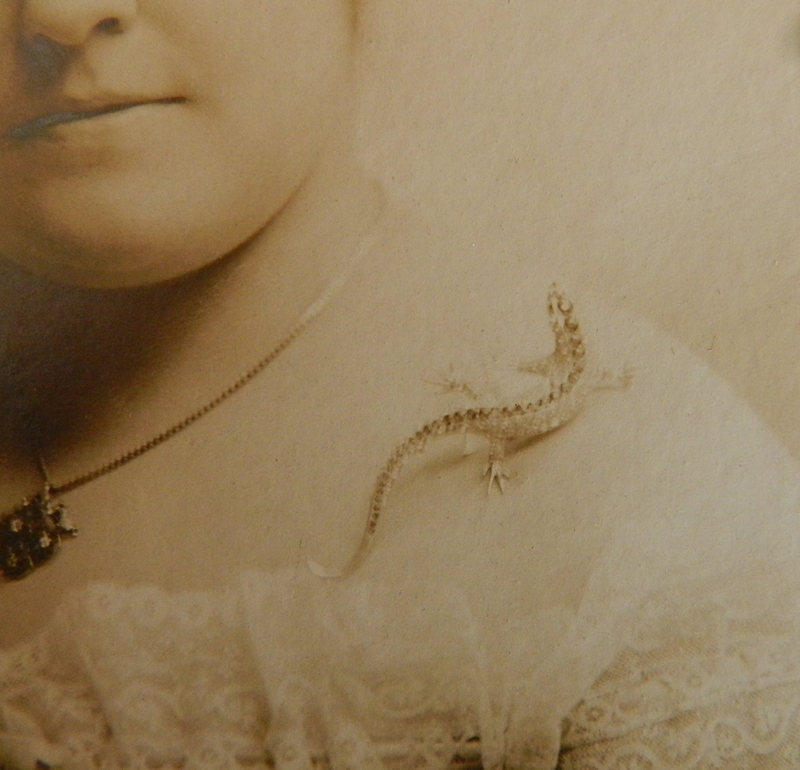 It’s a jeweled gecko. I’m assuming it’s a pin, like a brooch, but there’s not clothing for it to attach to here. She just balanced it there. Well, I can remember. April something. Pretty long ago. I could say I’ve been busy but that’s only part of the problem – I’ve been absent and distracted – not all a bad thing! – but it leads to a lack of blog posts. I have, however, still been sewing. 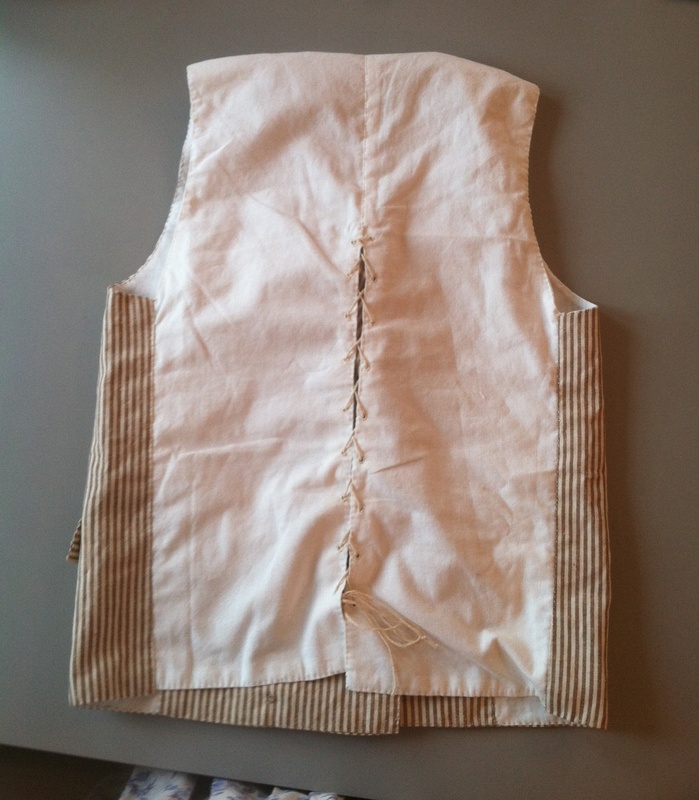 On the list of more awesome things I’ve sewn is my late 18th century waistcoat. 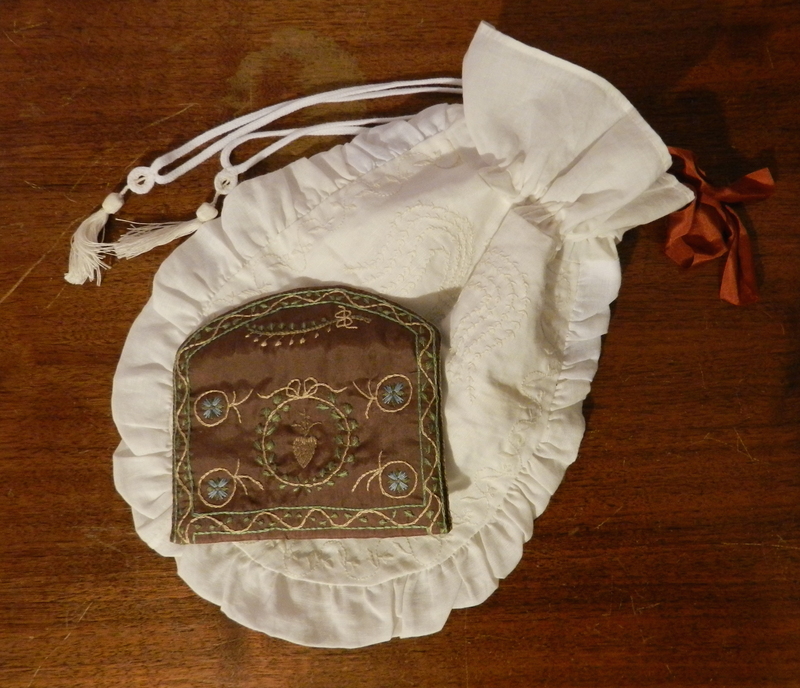 It’s made of cotton (cheap thin muslin for the lining and back, and slubby thicker stuff for the front), too-heavy pewter buttons which will be replaced by nice light brass ones eventually, and a bit of cotton cording for the back. 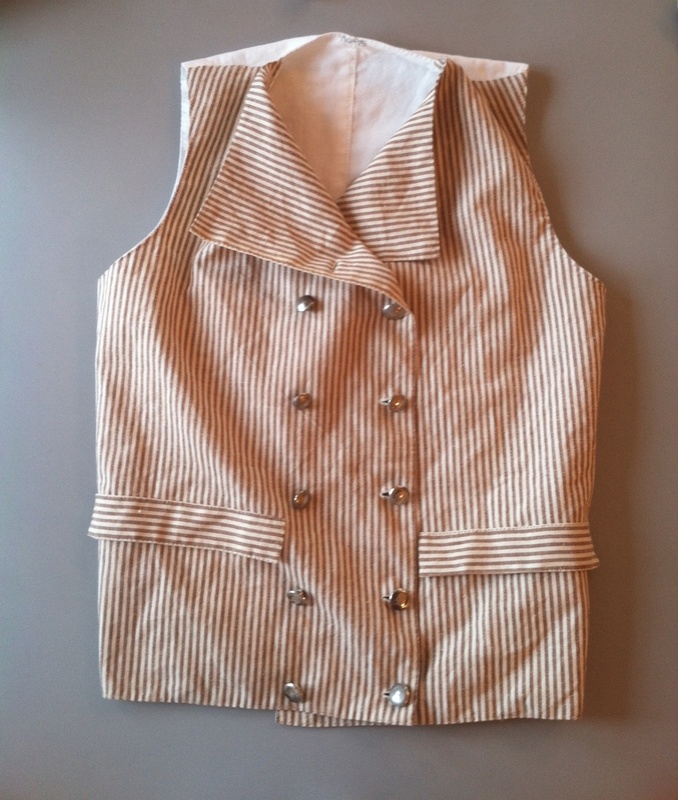 Since I made this waistcoat for my upcoming sailor/Royal Navy look, I had to make concessions in the original fit. That’s why I added the lacing up the back. I didn’t want to add darts … those would have been too blatantly obvious. 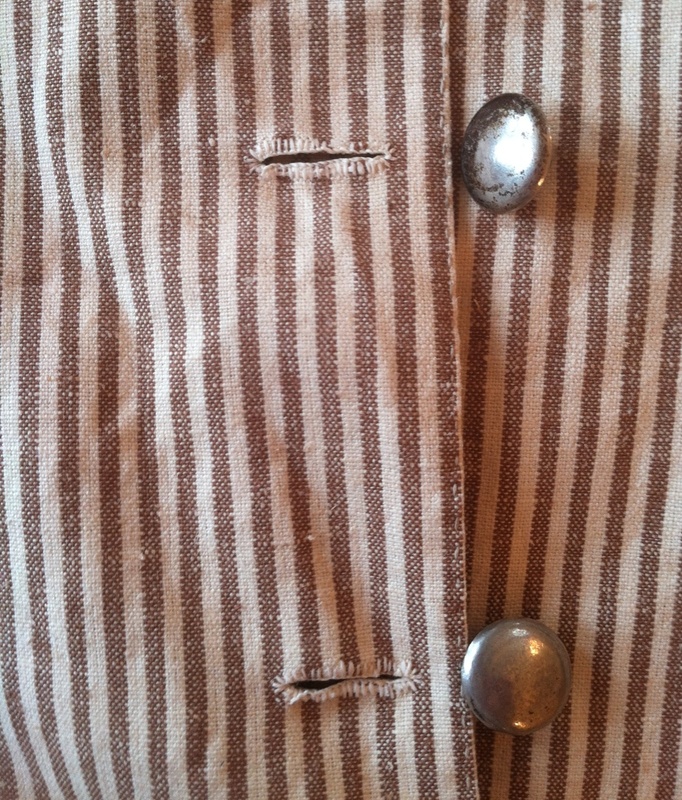 It’s 100% hand sewn with linen thread – and I drafted the pattern myself after looking at some originals. I HATE buttonholes – but I wanted a double-breasted front so badly. I started this waistcoat with a lot of apprehension, because I was procrastinating the buttonholes until the last minute and that means if they turned out badly, I’d be messing up a pretty much finished waistcoat. Then a coworker asked me if I’d be using a buttonhole stitch. “What’s that?” I asked. Um, yeah. The reason I’d never been able to make a nice buttonhole is because I never knew how. Don’t know how that happened, with all the research I’ve done. So I used a buttonhole stitch for the first time and they came out nice! 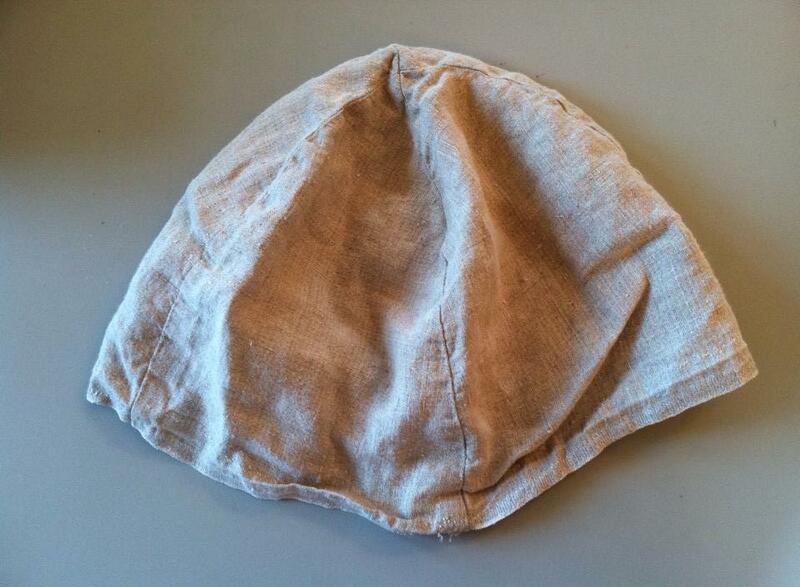 The second project I’m taking on right now is a workman’s cap. Well, that’s what it began life as, about 15 years ago. Dad wore it, it was forgotten, and I cut the seams apart a few weeks ago in order to take a pattern from it and remake it. Then I thought, I have the time. I have a brand-new pack of Sharpies and a spool of linen thread. Why not go crazy on it? 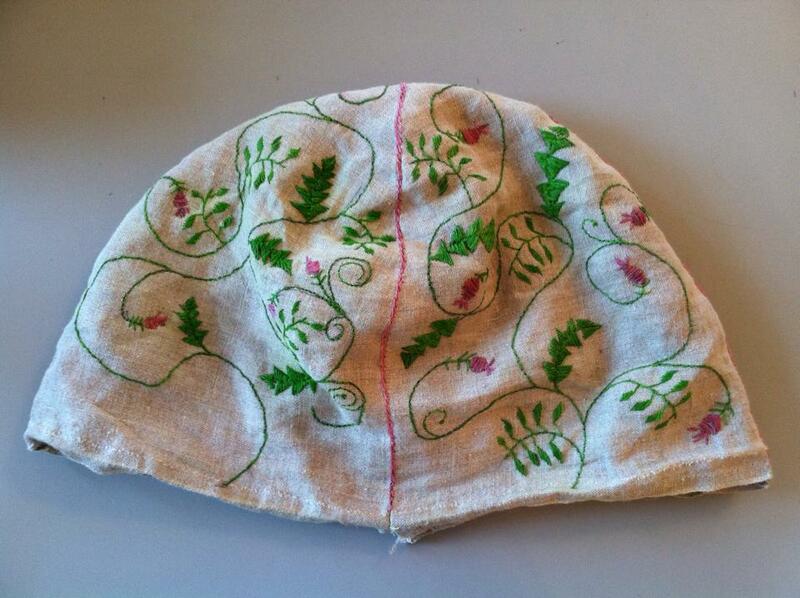 So it’s becoming this: The banyan cap of epic awesomeness. Bam! And I haven’t finished adding to it. Honestly …. it’s not super accurate. The linen thread is, yes, colored by Sharpies (my fingers are a nice shade of neon yellow). Just the fact that it’s embroidered with colored linen is a little off too – it’d be way more accurate with wool embroidery. 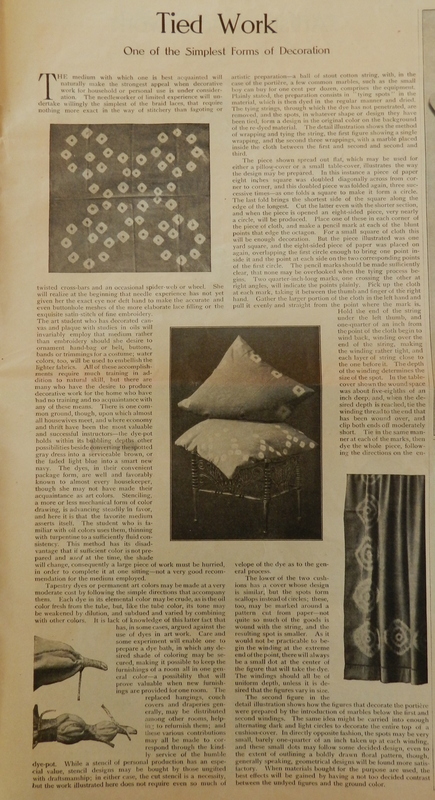 The pattern is probably a little off too, even though I’m basing it on mid-18th century embroidery and block print motifs. But hey, it’s garish!! It’s letting me practice my satin stitch, and I even taught myself a chain stitch on it. It’s like a sampler. And it’s building my confidence in embroidery, so much that I’m considering an entire garment sometime. But that will have to wait. Next on the list is the quintessential sailor’s jacket of the late 18th century – the mariner’s cuff, brass buttons, double-breasted, navy blue woolen goodness that I can’t wait to begin. 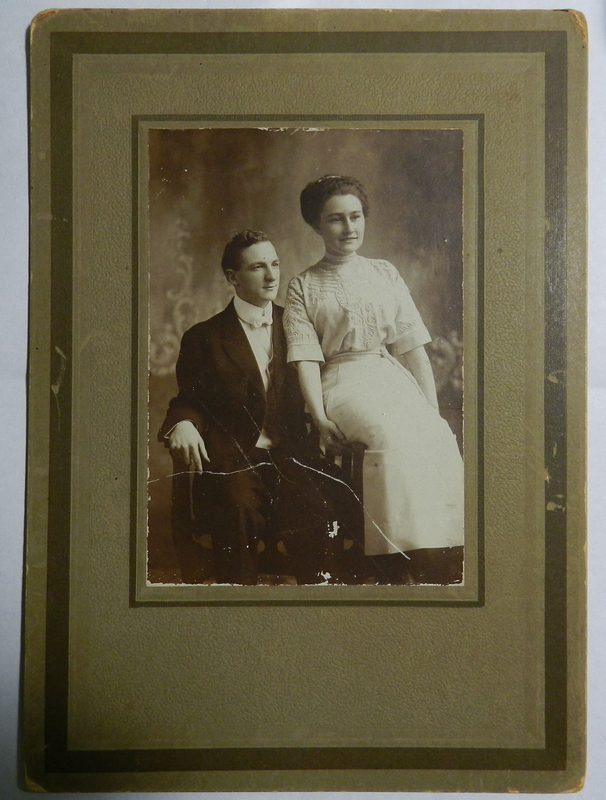 I bought this little snippet of a couple’s lives at an antiques store a few days ago. 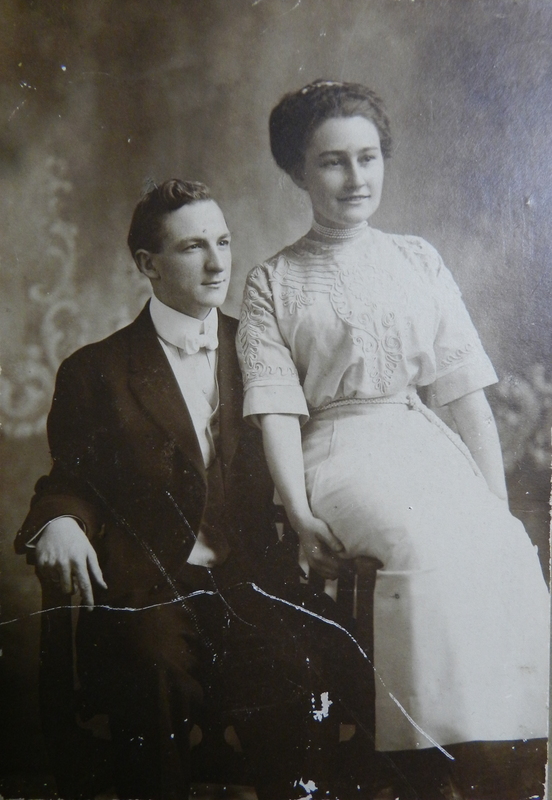 It’s a studio photograph of Herbert and Margaret Hind, taken in Delaware in 1909. They came to Delaware from Lowell, Massachusetts – or so says the inscription on the back, at least. Mr. Hind is super dapper in his nice suit and well-starched collar and shirt. 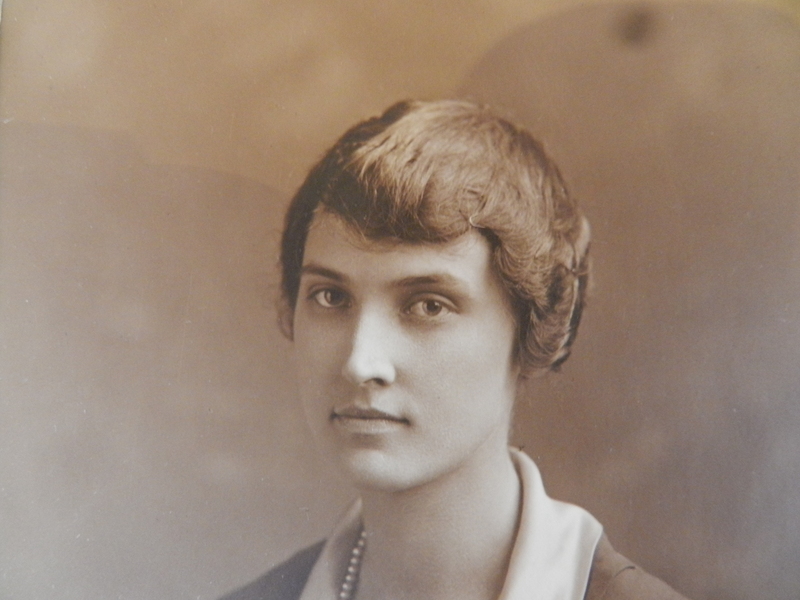 Mrs. Hind is wearing a heavily embellished tea gown, with a multi-strand choker of pearls and a rope around her waist. The rope belt/sash coordinates with the heavy couched decorations on the torso and sleeves of her gown. 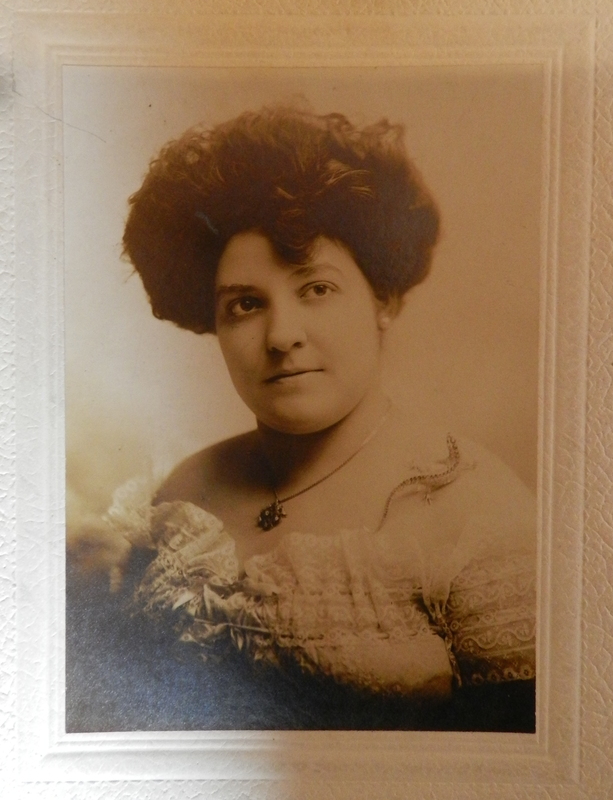 And finally, I’m always impressed with how most, if not all, people in these older photographs have such nicely done hair. it’s a studio picture, so I’m sure they dressed up a little, but it’s still kind of impressive. 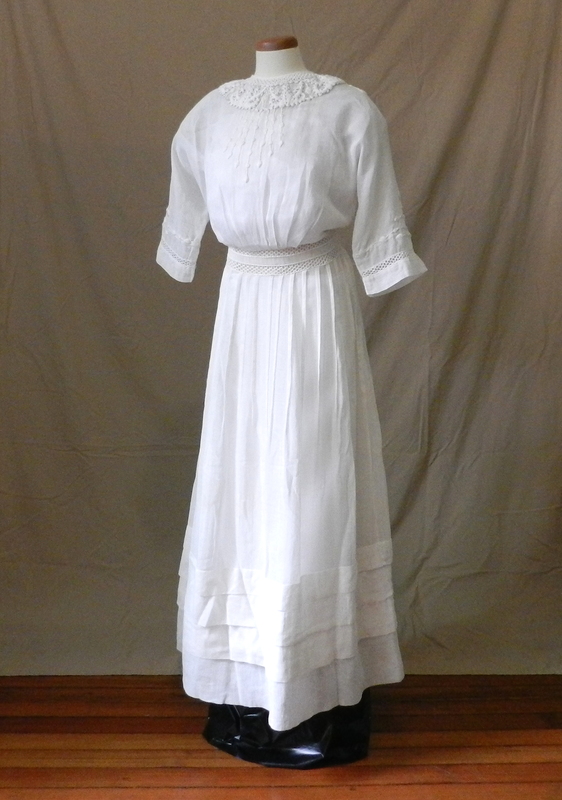 Mrs. Hind’s tea gown is very much like one in my own collection from 1911, below. 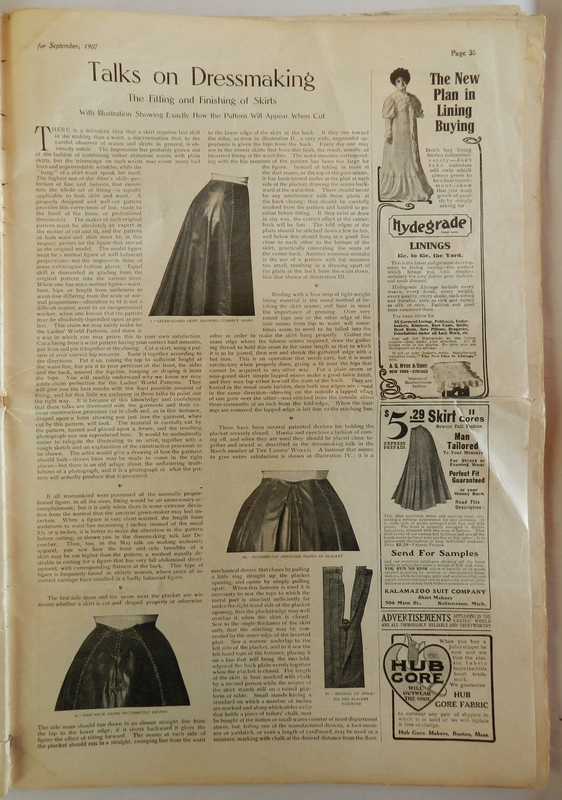 National Cloak & Suit Company tea gown from 1911, showing similar heavy embellishment on the chest and sleeves, elbow-length sleeves and wide-hemmed cuffs. I like the seaside color scheme of navy, white and coral. 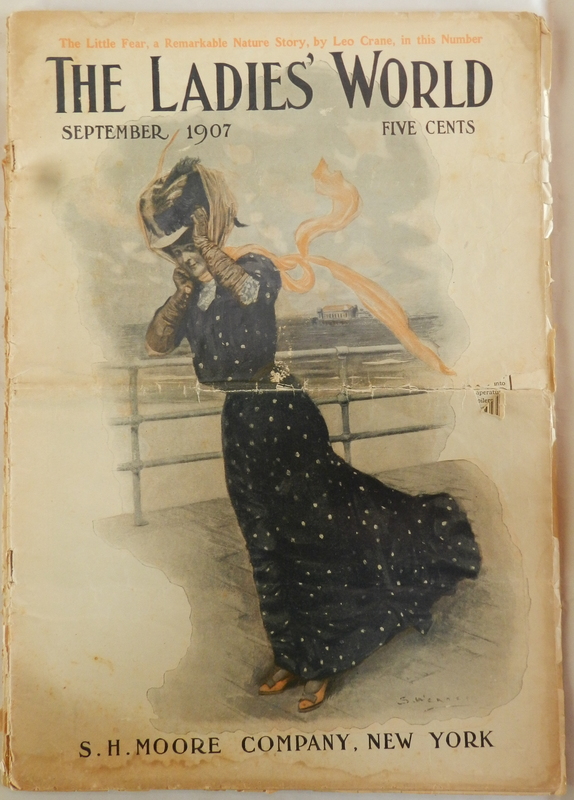 I love her outfit; so jaunty. Reusing old clothing by dyeing it. I’m wondering if the neon blaze-orange ink is a subliminal plug for the dye too. 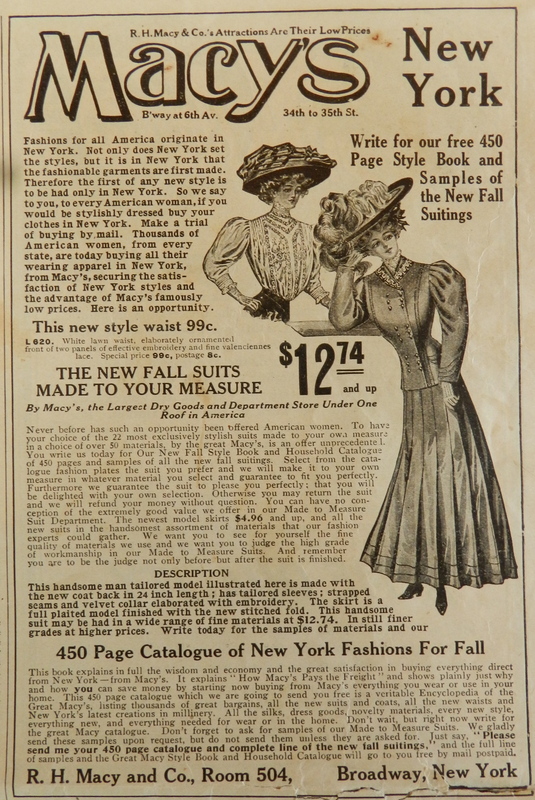 Fashions for November 1907. 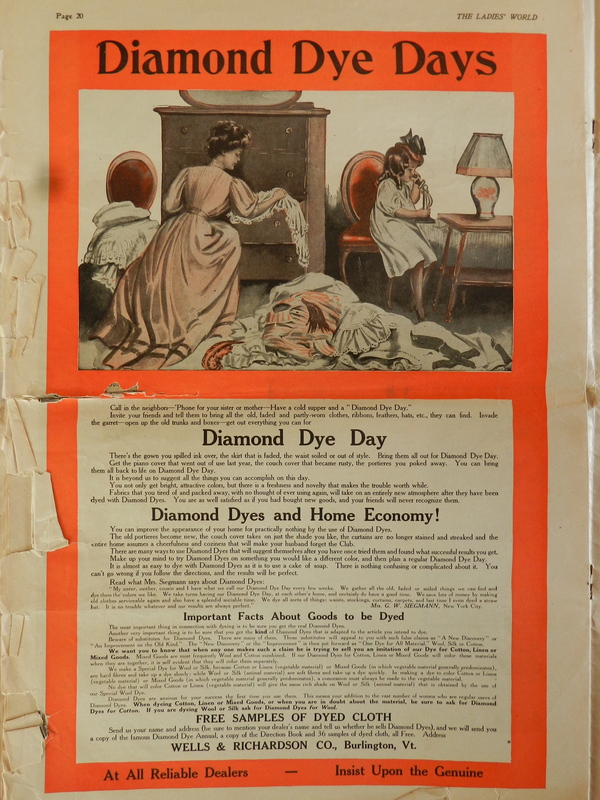 Click on the image for a larger picture with more detail. 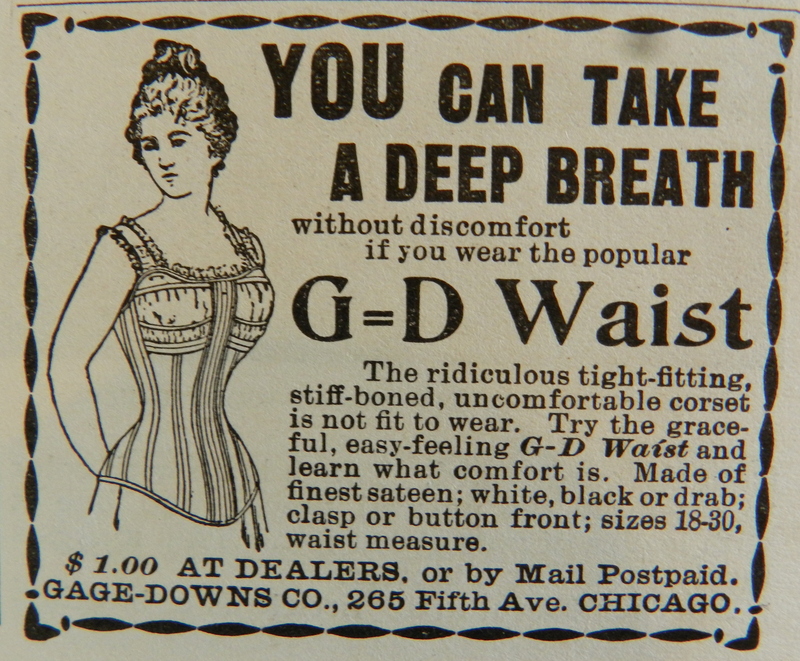 And check it out in the upper right corner … it’s the G-D waist again! How to properly fit a skirt. Other than that disappointment, I’ve been sewing like mad. Mad, I tell you! I just haven’t had the time to blog about it. Or take any nice photos. 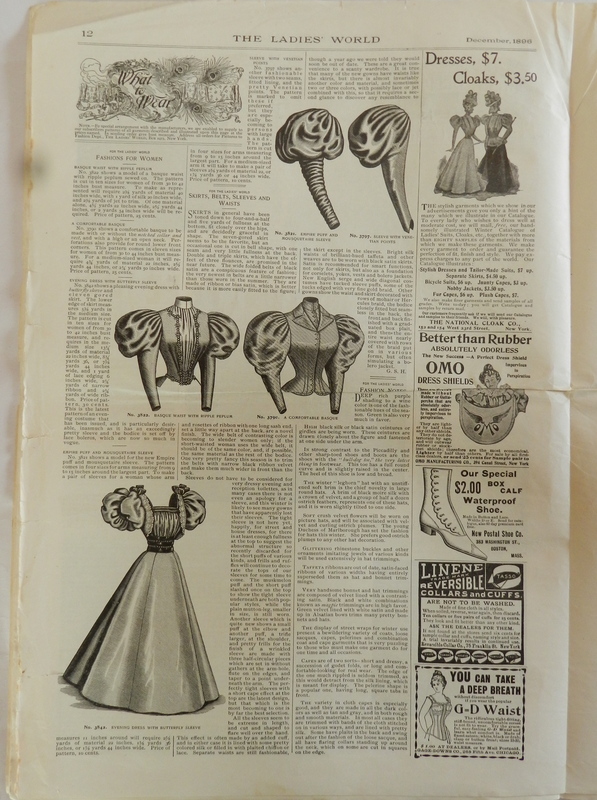 … and I’ve begun an 1880s-ish corset. All the 1917-1920 clothes I meant to make for the April HSF challenge, War & Peace, but I was so excited about them I started and finished them way too early. 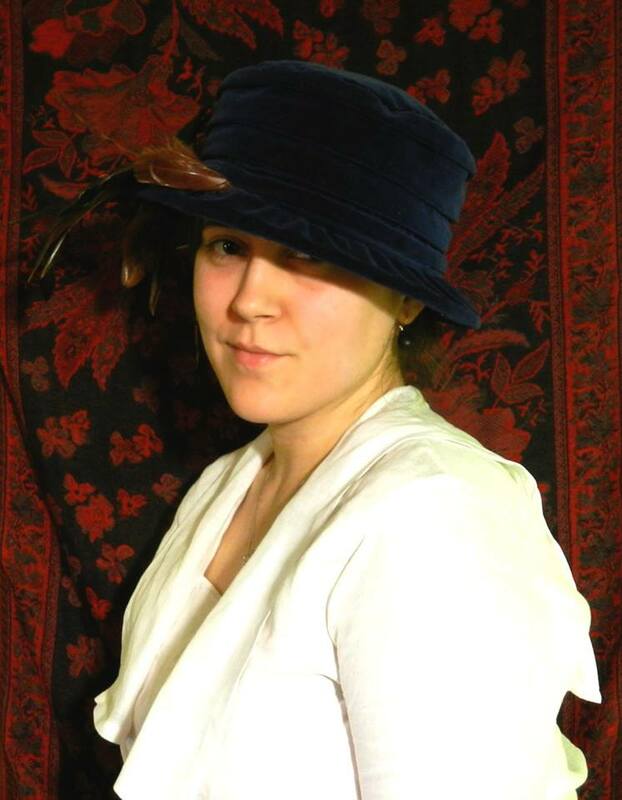 That worked out all right in the end, though, because I wore them for a women’s suffrage play I was in, with the last-minute addition of the Votes for Women brooch. I made all these with my 1902 Singer, which felt nice, because I was using antique/accurate tools. Yep, I know, nerdy. And because I’ve been awful at taking photos of my work, here are just the ones I’ve photographed. I’ll get pictures of everything later. I am in LOVE with this hat. I usually can’t find something big enough to fit my hair under, so I made it extra big. It’s got that big/loose hat thing that was going on in the teens and twenties, and I can actually put my hair up under it! Yay! I made the blouse in the photo above from one of my dad’s worn-out 18th century shirts. 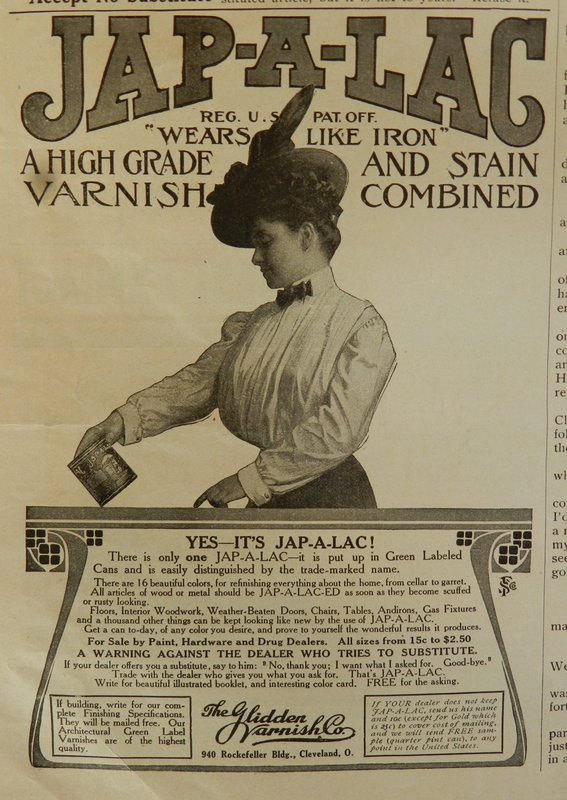 It was old and threadbare, so I don’t expect the blouse to hold up well. I’ve already popped a few seams – the fibers just fell apart. That being said, I’m surprised at how nicely the shape came out – the pattern was roughly based on one of my modern Gap button shirts. 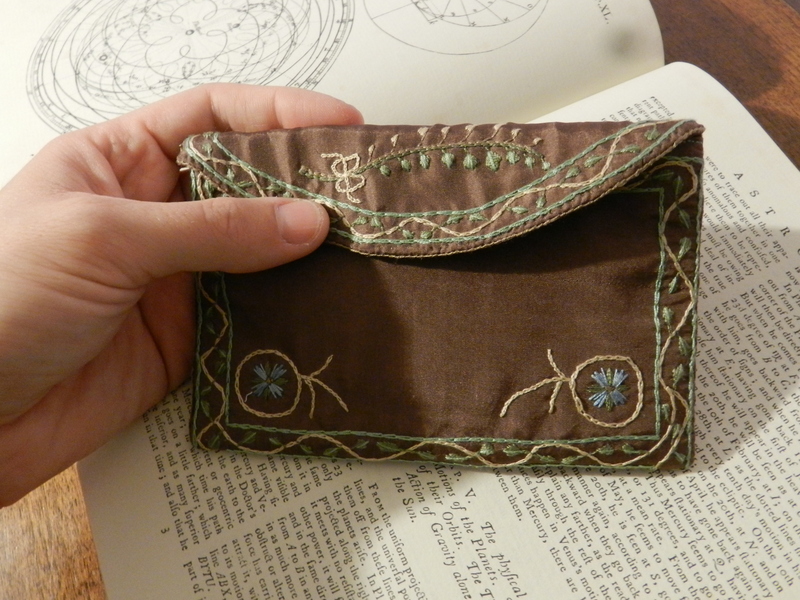 I’m excited to make another, hopefully in a nice batiste, or something that holds up better to drawn-thread work. 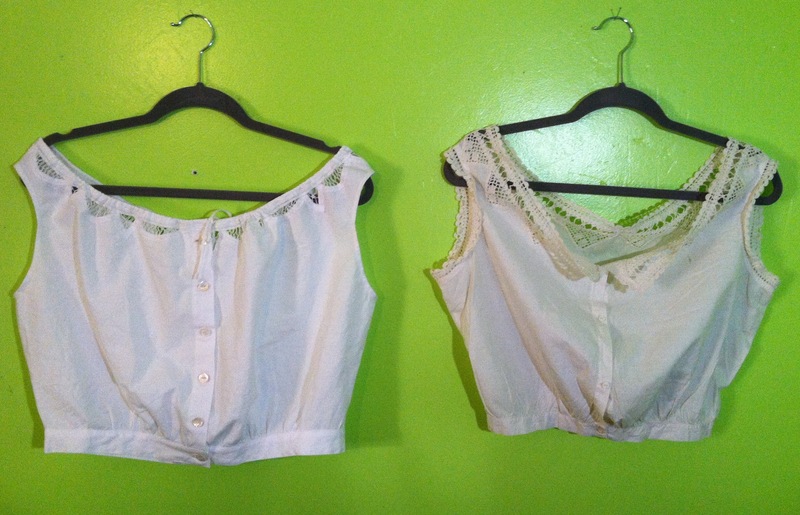 The corset cover (left) was taken right from my original (right), which is just a tad too small for me – not that I’d wear it. I made it from a thrifted tablecloth, mimicking the design of triangular lace appliqués at the neckline. I love it – it’s comfy and even though the materials and my workmanship are awfully crude compared to the original, it’s the best I’ve ever done with a sewing machine, and I’m happy. This is my ’20s evening gown. I wanted it to be kind of generic so I could wear it to events. The idea was to make a semi-fitted slip and to drape the velvet on that, but halfway through planning I realized I didn’t have any cloth for the slip. Being on a frenetic sewing high I made it anyway, substituting ribbon for lining. Now it looks like the dress has interior suspenders. It works nicely considering the velvet’s heavy and hot (it was a curtain! Thanks, Laura Ashley), and a lining would just make it more uncomfortable to wear. It drapes fairly well, too, so I don’t consider it a failure. And it’s super comfy! The beading came out okay; it looks better hanging than flat, as above. I made the mistake of putting the beads on too tightly, which messed with the straight Deco lines of the pattern I chose. Live and learn. This is my late twenties tennis dress. I made it, again, from a thrifted curtain and a few pieces of red bias tape. I like it; it’s very comfy. 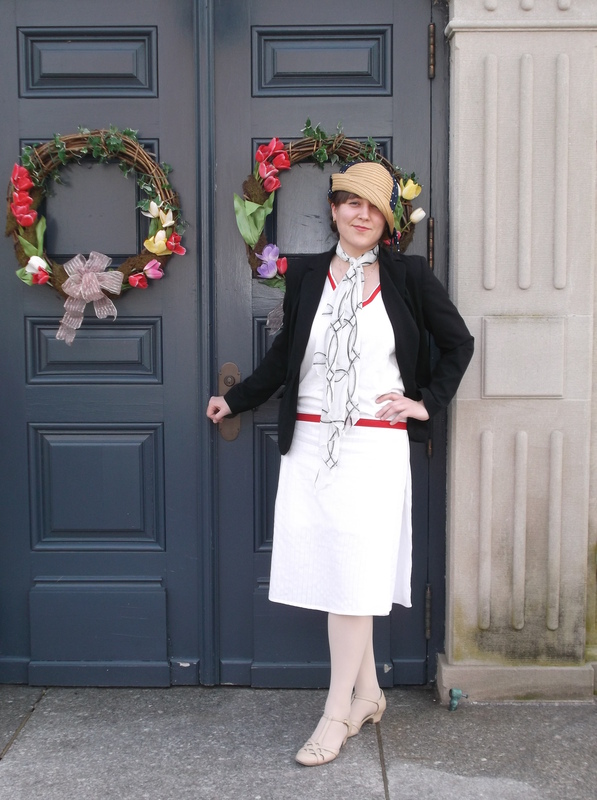 When I wore it to work with my re-worked cloche and a blazer it became very early-1930s-sportswear-ish. The dress itself is very basic; sleeveless with a V-neck and the skirt has two huge box pleats at the sides. Now I’m working on a new era: the mid-late Victorian. I’m starting with a basic corset based on an 1880s example, and I’m hoping that, for now, I can get away with the 1860s with it, too. 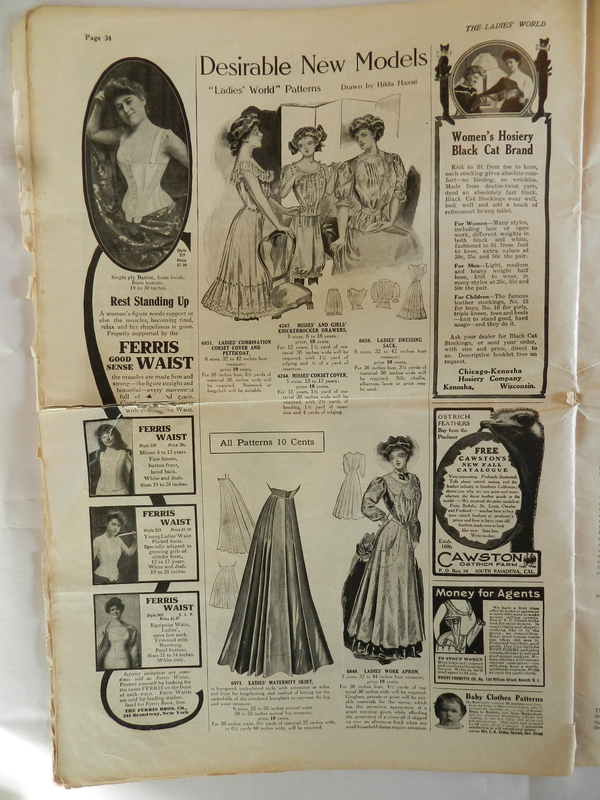 After that comes all the rest of the underpinnings and gowns and hats and shoes and stuff, which will be … challenging. 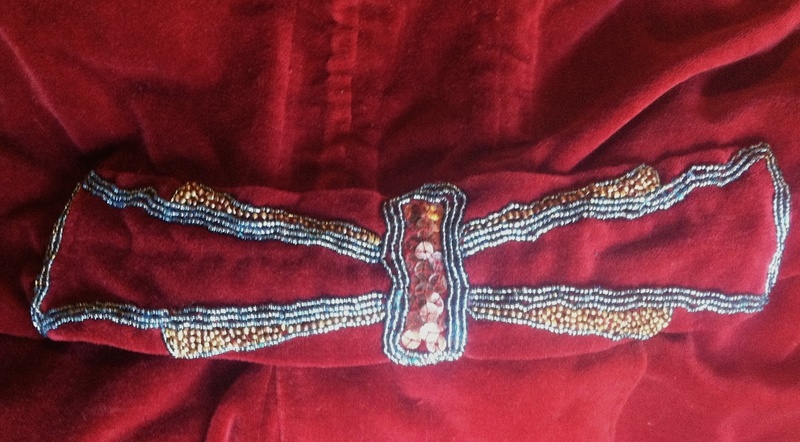 I have one long-term project, a 1900-1920s beaded purse which will take me a year, conservatively, to bead fully. It’s about 40% done right now, and I’m slowly working away at it. Good stuff! Who pays for all those clothes wantonly destroyed by well-intentioned female efforts? 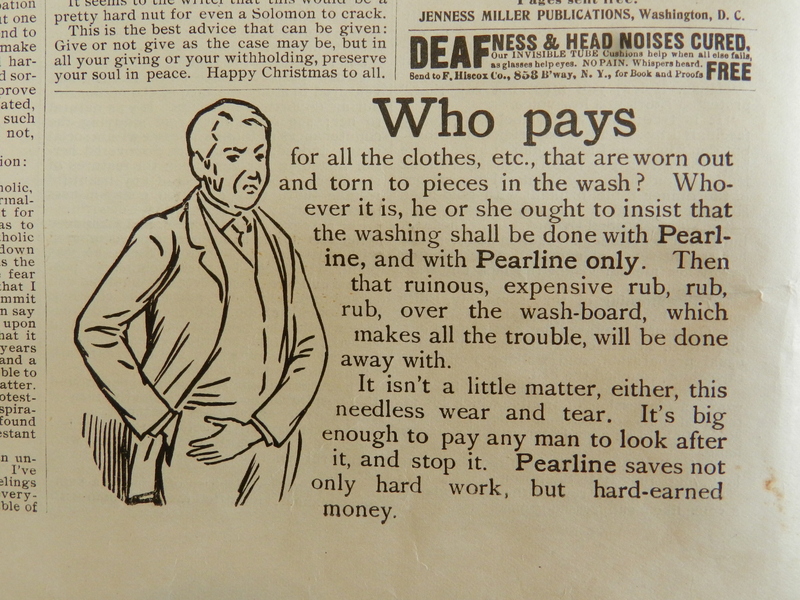 The disgruntled patriarch, of course … buy Pearline soap. 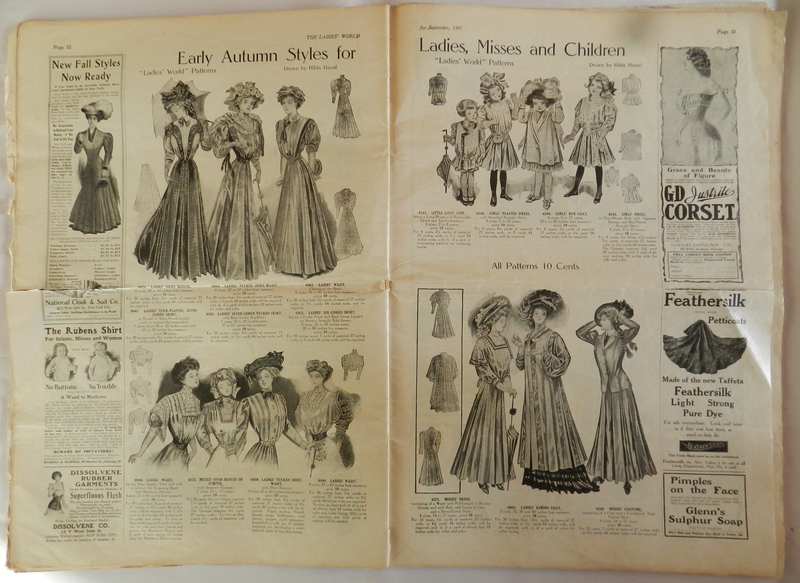 The magazine has one page devoted to Winter 1896 fashions: Big sleeves are IN. I’m still a little confused over this ad. 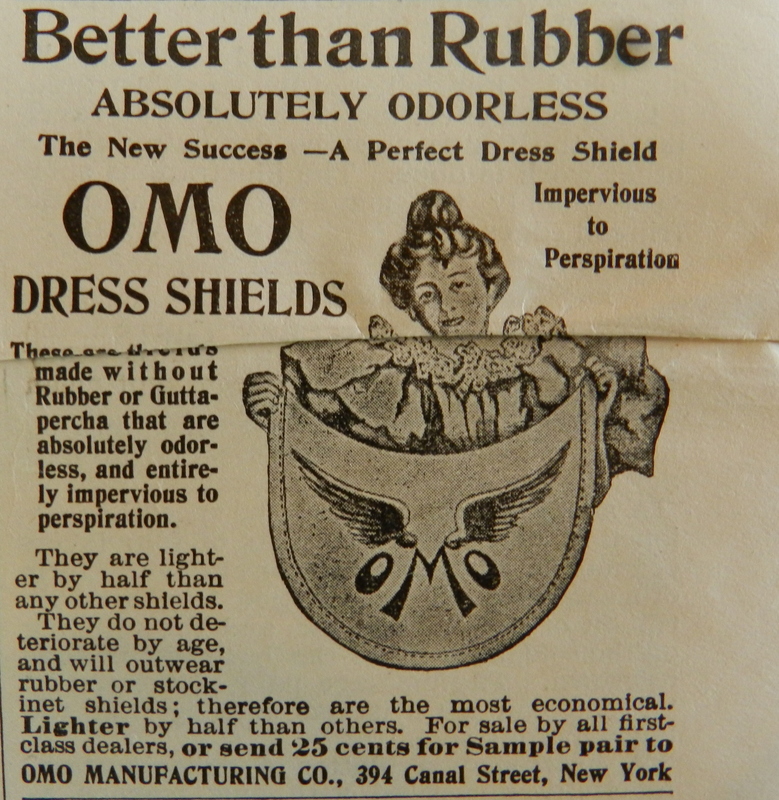 Maybe these are like modern ones that fit into the armpits of dresses? Some truth in advertising is lost with the perspective of the image, I think. … As seen on TV. 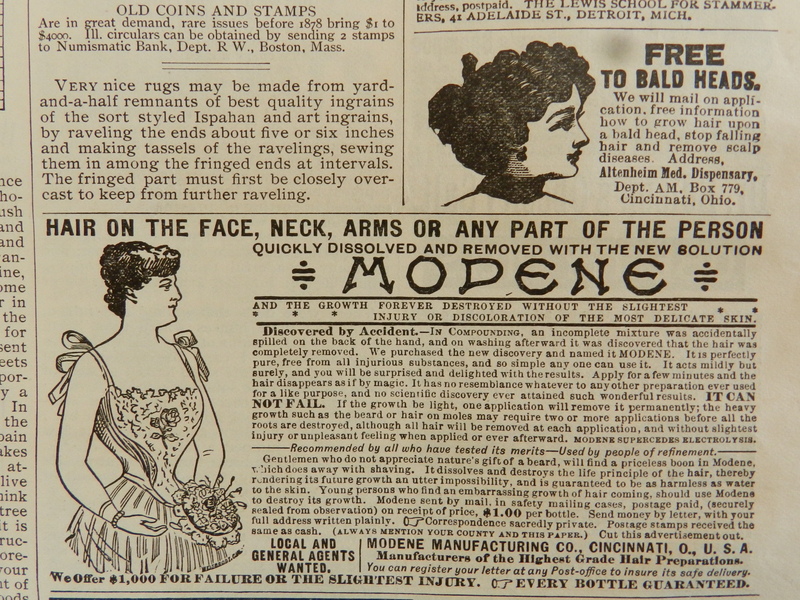 An interesting note on beauty – hairless arms! Balanced by the advertisement for wigs directly above. 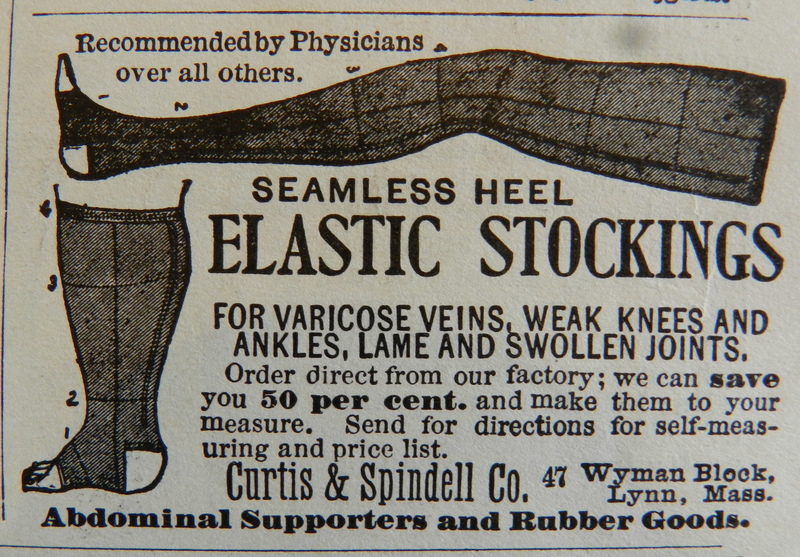 Gotta love these old ads. 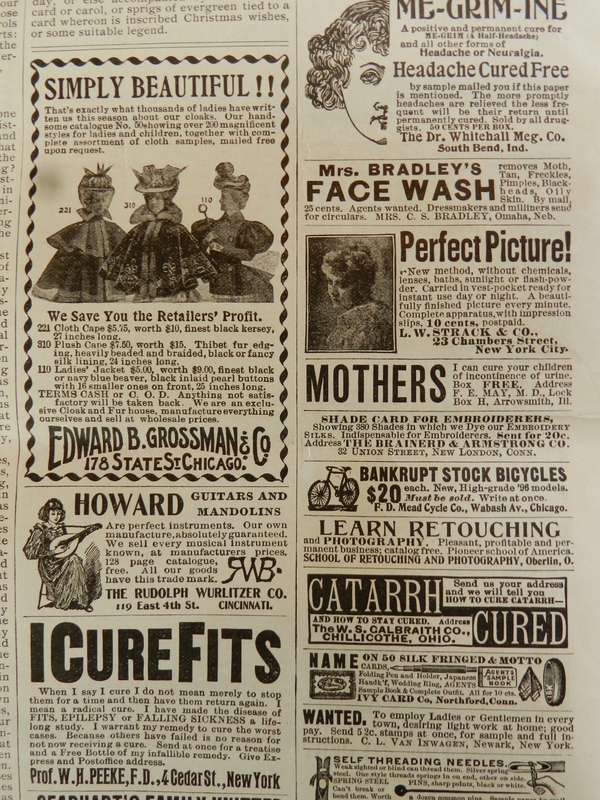 I’m interested in the photo retouching ad and the ‘Bankrupt Stock Bicycles’.